A couple of months ago, I posted a list of 16 alternatives to Microsoft Money. GRS readers left nearly 200 responses evaluating the various personal finance programs available on the web and for the desktop. One feature that many users crave is the ability to project their future cash flow. While it's important to track where your money's gone, some folks find it valuable to predict where money will go in the weeks or months ahead. Why would you want to track your cash flow? The power of positive cash flow cannot be overstated. Back when I was living paycheck-to-paycheck, I was spending as much as I earned. Or, more often, more than I earned. It was only when I was able to create — and maintain — positive cash flow that I could repay my debt and begin to save. Positive cash flow is how we build wealth. Uses a check-register format to track your transactions. Allows users to edit transactions and categories as needed. Supports split transactions and bank reconciliation. 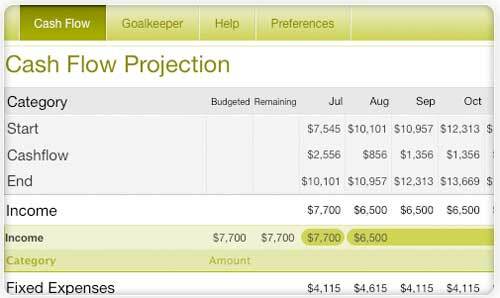 Allows users to set and track financial goals. With Green Sherpa, budgets are a thing of the past, literally. Budgets only represent an AVERAGE, or IDEAL, month. In reality, cash flow is more fluid than that. Green Sherpa's Cash Flow Projection feature allows you to create a forecast of future cash flow based not only on your historical spending but, more importantly, on your future PROJECTED expenses and income. This feature lets you enter one-time anticipated expenses, or create more complex structures such as bi-weekly or bi-monthly schedules. I could see this tool being very useful for certain people, especially those who struggle to budget with an irregular income. If your income is variable, a cash-flow management tool can help you stay on-budget. So, what's the catch? Though nearly all of its competitors are free, Green Sherpa costs money. You can sign up for a 14-day free trial, but after that it's $7.95 per month ($5.95 per month if you sign up for a year at a time). Some of you will be happy to pay $7.95/month in order to obtain a good cash-flow projection tool. Not me. I'll stick with desktop Quicken for now. There are 21 reader responses to "Green Sherpa: An Online Cash-Flow Management Tool". It’s not something I would pay for either. I’m happy using excel to track what I need to. Quicken’s desktop programs also do cash flow projection. but I’m not sure about Quicken online. I haven’t used the user entered future expenses/income, only my historical data, but it allows you to manipulate the historical data also, removing large 1 time income and expenses, for example. Quicken seems to be a cheaper option of paying a one-time $60 or $90. Actually I just went to their website and all their software looks to be currently $20 off. If only Mint would implement some cashflow projection; I’d hate to have to switch all my info over. Most of these online softwares don’t have Canadian versions or aren’t able to track bank accounts, trading accounts, credit card accounts and so on. It does sound like a pretty handy tool, but I think I’ll stick with a spreadsheet for my projections. Quicken online does short term cash flow. 1-2 paycecks out. It automatically tracks your recurring bills and income. You can view a graph as well as set alerts when your available cash falls below a certain amount. My husband (who handles the money tracking for our household) uses KmyMoney, which is free to download and use. They just released a 1.0 version that does a lot of stuff. Hubby has been donating some of his time to help develop the program. I used to use Excel when I was single- I found it useful to run the exercise of future cash flow by figuring it out myself. I currently do not use any software to track cash flows, but this would be useful. Looks like it is worth checking out. On another note, cash flow is huge! My goal in life is to have a multiple stream of cash flows. The reason is because if I lose any one or two of these, I will still be able to continue building wealth. Cash Flow forecasting is the most heavily used feature in MS Money that I use. Any tool I would choose to replace it must have that included. The fact that this is online doesn’t really worry me too much, as long as it could be used the same way I use Money. I don’t use it to connect to banks or anything. I enter transactions and keep track of single and recurring bills to project cash flow. I love the money management tool recommendations but you can still use MS Money, maybe indefinitely. I am using MS money 2003 and it works just fine, I don’t update stock quotes or program updates but I do download transactions from my bank, and it works like a champ. The program does everything I need, including cash flow projections. I’ll keep using it as long as it works. I don’t see myself using an online tool, I don’t care what kind of promises an online service makes, I’m not exposing that data to the intertubes. Don’t leave home without it! 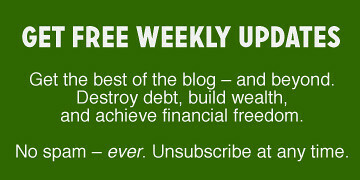 Basic account is free … or you can upgrade to premium for some additional features/functionality. hi, i’m wondering if anyone can recommend any programs/spreadsheets good for tracking stock trades performance. i dont particularly trade often (once or twice a month usually). I’m hoping to have a spreadsheet tracking the performance of the investments in equities as a whole, and not just the performance of each trades. It’s a nice product, but it’s not for me. I can’t get over the problem of spending $95 a year to get someone else to do something you can do yourself with 5 minutes work in Google Spreadsheets or Excel if you have it. If you use Green Sherpa for the rest of your working life (let’s take me at 26 with a planned retirement at 50), that’s Â£2,289.60 not even taking into account the inflationary pressures that’ll put the price up every few years. Imagine what that sum would do with compounding interest in your high yield savings account! GnuCash is free software which, in my opinion, beats the heck out of every other personal finance software. Somebody must be listening JD. Microsoft is reportedly going to buy Mint.com for ~$170 million. We’ll have to see if they can bring Money online, and how much they’ll charge for a premium membership. D’oh – that’s embarassing. It’s Intuit, not Microsoft that’s bidding for Mint. Checkout http://www.pocketsmith.com is the best service of this kind! I am exhausted from looking for adequate replacements for MS Money’s cashflow tool. Nothing mentioned so far has been what I need. I want the graph, I want the ability to set a custom time frame as far in the future as I’d like. I want to be able to include my scheduled paychecks and bills, as well as my budget items. I have to be able to try out cash flow scenarios. I need it to show me where my lowest balance is and my highest balance, and I want it to work for all of my accounts. I am open to trying Quicken, but so far it has not had the versatility or flexibility that Money has provided. Someone please bring Money back!